The last couple of weeks have been very busy! I started spring break off with a trip to San Diego for the National Art Education Association annual conference. This is the absolute best professional development opportuntity there is for art teachers and a great opportuntiy for practicing artists, as well. I was able to attend because of a generous grant from the good folks over at the Cultural Arts Foundation Northwest. If you are unfamiliar with this organization, please click on over and give them a look at: http://www.cafnw.org/. They do a ton of good work for the local arts community and can always use more support. I went to the conference with more of a focus on things that could help me, as a professional artist--and I wasn't disappointed. From the amazing, inspiring works at the San Diego Museum of Art to some amazingly helpful sessions on promotion and web tools to the great food in the Gaslamp district (check out Meze'-- http://www.gaslampmeze.com/ -- if you ever find yourself down there! ), the trip was a complete success! I already can't wait until next year's NAEA conference, which will be down in New Orleans! Just because I came home to the remainder of Spring Break didn't mean it was time to relax. After a short, one day of recouperation, it was right back into the studio to put finshing touches on the works for my show at Frodel Galley. The show is up now and I'm very proud of how it looks. The difference between completed works, scattered around the studio and completed works, hung the way they were intended to be viewed, just can't be understated. 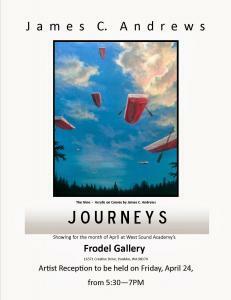 I hope that you will be able to join me at the reception for this show on the 24th of April, from 5:30-7pm. Please click over to: http://wsa.celebrations.com/JCAndrews-Frodel to find the e-vite to this reception. It's always good to try something new. I find that whenever I go out on a limb and open myself up to a new experience, I'm able to take that newness back to my own work. It adds a new--and sometimes much needed--facet to my process. Baby steps are good. Big, scary leaps can offer big rewards. You have to find the level of risk you're comfortable with...and then go for it. For me, the latest new experience is going to be teaching a three part workshop on classical figure drawing techniques. I'm really happy to have this opportunity and can thank my good friend Derek Gundy and the great folks over at Artists' Edge for making it available to me. I teach art every day, at the high school level, so it may not seem like one of those big, scary leaps to teach a small workshop--but I'm expecting this to be a very different experience for me and I'm very excited to get it going. I hope there are some of you out there that will see this workshop and think of it as an opportunity of your own. Is it a baby step? Maybe you used to draw all the time and want to shake some rust off and get back into it, with a little help. Maybe it's a leap of the big, scary variety--your first workshop, perhaps---NO IDEA what to expect! How cool is THAT?!!? If you think this workshop might be a leap worth taking, for you, you can click here to head on over to the class page and sign up. There is limited space so you should reserve your spot early.